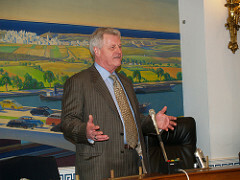 Is Collin Peterson Sabotaging Climate Policy? Well now, it seems like just about everyone's keen on figuring out if Agriculture Committee Chairman Collin Peterson is going to single-handedly destroy the House climate bill or not. The latest: Here's Chris Bowers calling on liberals in Minnesota's 8th to unseat Peterson by voting third-party and tipping the next election to the GOP—since a freshman Republican could presumably do less harm to the Dem's green agenda than a conservative, climate-change-denying committee chair. (Personally, I doubt Peterson's ever at risk of losing, or that there are even enough liberal voters in his district to tilt the balance.) Meanwhile, Matt Yglesias has a post today on Peterson's odd district, which includes a small sliver of land accessible by land only via Canada, and that once tried to secede from the United States during a dispute over fishing rights. Peterson, curiously, supported the secession attempt. The emission allowance issue is one of at least three items that Peterson has raised with Waxman as Democrats try to secure the necessary 218 votes for floor passage. Also on the table is debate over the Agriculture Department’s management of the carbon offset program and whether to hold the ethanol industry accountable for “indirect” land use, like crop conversion in other countries. Then there are agricultural offsets, which I mentioned yesterday. On this, Peterson really could weaken the bill's ability to reduce U.S. emissions if he allows too many dubious agricultural projects to get included as carbon offsets. This is the issue to watch closely, especially since, as a recent EPA analysis suggests, the current bill's already-heavy reliance on offsets could allow polluters to postpone making serious cuts for quite some time. More on this later. The third issue here is that some farm-state Dems want to exempt all ethanol from "indirect land-use analysis." As researchers have pointed out, when you divert corn or soy from the world's food supply to make fuel, it often causes farmers in developing nations to hack down rain forests to plant their own corn or soy. The EPA recently proposed to take this into account when figuring out ethanol's emission footprint. The ethanol industry hates this idea, for obvious reasons. And Peterson raises a ton of money from agribusiness, so he doesn't like it, either. Now, this would be an ugly concession, but it's also true, as Joe Romm observes, that the 2007 energy bill already exempted 15 billion gallons of corn-based ethanol from scrutiny—more corn ethanol than is ever likely to be produced in America. Most of the real damage has already been accomplished.